Fear of snakes is one of the most common phobias among humans, but we still seem to have an odd fascination with the slithery serpents. Their slinky shapes and perceived forbidden nature are featured prominently in plenty of jewelry, clothing and accessory designs. 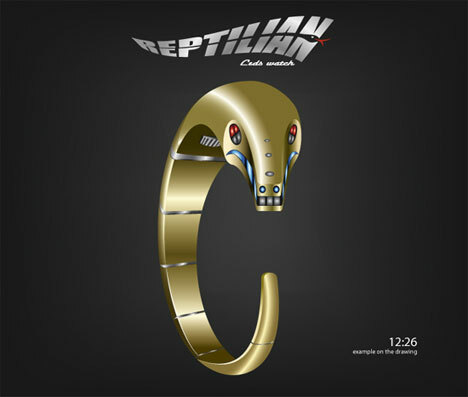 The Reptilian bracelet watch concept is a stylish take on serpent fashion, melding technology and nature into one stunning timepiece. 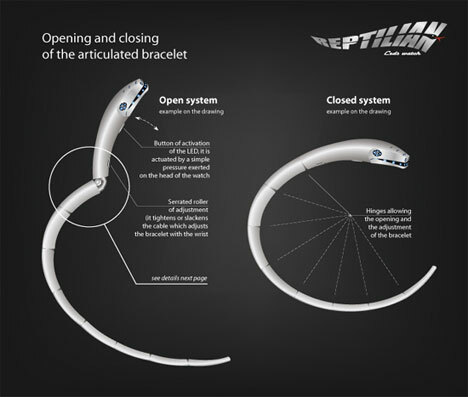 The articulated band opens and closes easily to fit almost any wrist. But the really stunning part of the design is the way in which it tells time: with individual lights that illuminate in a specific pattern to delineate the time. Although it would take a certain amount of practice to learn how to tell time on the device, the Reptilian would definitely get attention. Pressing down on the snake’s “head” illuminates the embedded LEDs, lighting up the design so it’s readable even in the dark. The designer, a French man referred to only as “Patrick,” says that the focus of the design was on its adjustment and the way the body wraps around the wearer’s wrist, hugging it intimately. 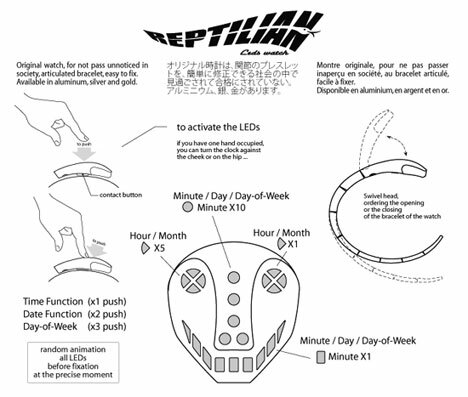 The Reptilian is only a concept at this point, but its clever design and fascinating functions may one day help it find a producer.